We are excited to be partnering with BlackRapid once again to help raise awareness for breast cancer and drive donations for our foundation. Did you know that we provided over $100,000 of donations directly to breast cancer patients last year? We want to do more! Breast Cancer Awareness Gifts Great for Everyone! The winners for our giveaway are listed below following each giveaway widget! Emails have been sent to the winners. Thank you for participating. Note that The Tutu Project runs giveaways and prizes from time to time, with no purchase necessary. We use Rafflecopter to randomly select a number of winners from your entrants pool, verify the winners’ entries and announce the winners directly on the widget. This giveaway will randomly select FIVE WINNERS from the pink Kick strap giveaway and TWO from the Prints. The Kick is optimized for women photographers. Ergonomically curved and customizable with BlackRapid standard accessories. It’s customizable with BlackRapid’s standard accessory systems and packs away easily for travel. 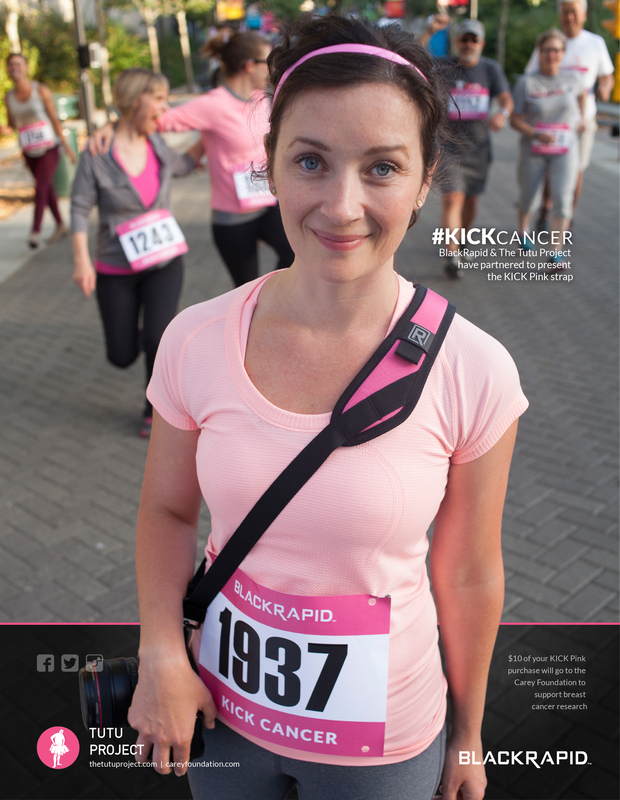 The pink Kick Camera Strap from BlackRapid is a lightweight strap specially designed for women. It is worn diagonally across the torso from shoulder to hip and is adjustable to fit most photographers. A locking ConnectR connects the strap to the FastenR in the tripod socket located on either the camera body or the lens. Once connected, the camera hangs upside down, resting securely at the side or in the small of the back, with the lens pointing behind. The strap has a curved pad for added comfort and is customizable by attaching a variety of BlackRapid accessories. It also comes with a LockStar Caribiner Protector set of two. The pink Kick Strap from BlackRapid is available for pre-order. Ships after June 1. 100% – YES, 100% of the proceeds are donated to the Carey Foundation for families with breast cancer. We are so grateful to BlackRapid for this opportunity. I’m so excited to have won in the pink Kick Strap, thank you so much ! I entered to support breast cancer, and because I love taking photos and this will come in so handy. I’m so excited to have won! I entered because breast cancer non profits are very near and dear to my heart! I love how much of an impact you givery! My grandma is a breath cancer survivor, thank God! I pray I don’t get it as I am 27 years old. I love taking photos…. AND I MEAN LOVE! I can’t afford a camera of my own at this time as my husband and I are going through a rough time right now with no income and our car needs fixed so bills and getting the money to fix our car is first priority right now! I’m so excited to have won and I will continue to pray for those fighting breast cancer! God Bless! Thank you The Tutu Project!! I love that you’ve partnered with BlackRapid and not only chose to do a giveaway, but that 100% of the profits are donated to the Carey Foundation. I entered not expecting to win, but I love that it will become a talking point and be able to share with others when they ask about the pink Kick Strap and that all proceeds go to helping families dealing with breast cancer. ? BlackRapid is a great partner and we’re over the moon happy to be working with them. Thank you for sharing our project! Yay, so excited that I won! Thank you! I entered to support breast cancer awareness. I love the tutu project and what it stands for! Awesome!!! Thank you!! The Tutu Project is a great asset!! You’re most welcome! It ships in two days and we hope you enjoy it!